The authorities in Vietnam plan to enforce a two-child policy in an attempt to control population growth. They say it is needed to avoid putting a strain on public services in the country of 86 million people. A similar policy was introduced in the 1960s, but it was relaxed in 2003 to encourage small families without making it illegal to have a third child. 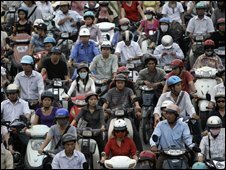 Critics of the government plan have warned that a younger population is essential to Vietnam’s development. Government statistics show that in the first nine months of this year, 93,000 babies were born to couples who already had two or more children. Under current rules, married couples have largely been at liberty to chose how many children they want and when to have them. But according to the deputy head of Vietnam’s General Office for Population and Family Planning, Duong Quoc Trong, these rules have been “so general that people haven’t understood it and have sometimes taken advantage of it”. “The demographic boom is damaging the country’s sustainable development,” he said. Giang Nguyen, head of the BBC’s Vietnamese service, says that urban parents have felt increasingly able to have more children as their living standards have improved. For poorer parents, a large family can act as security in their old age in a country without universal state pensions, he adds. The UN Population Fund (UNFPA) has said that Vietnam should reconsider the plans because “it will be difficult to increase the population again decades after”. Vietnam currently has a population growth rate of 1.3%, which has remained largely unchanged for the past few years, according to the UN. “In Vietnam now, life expectancy is rising, the fertility rate is decreasing and in the next 20 years, many people will be in the senior group,” said UNFPA spokeswoman Tran Thi Van. Certain groups would remain exempt from the new regulations, officials said, including ethnic minorities with low populations, and couples who were remarrying or had lost a child. The proposals will be voted on by the National Assembly later this year. If they become law, parents would be penalised for having more than two children. Officials have not yet said what the punishment would be, but they could include financial penalties or demotion at work.